Discectomy surgery is performed when a patient suffers from herniated discs, a condition that affects millions of people worldwide. And many of these patients report severe and debilitating pain that harms and affects their quality of life. A discectomy operation is when a small portion or the entire damaged intervertebral disc is surgically removed from the spine that is pressing against the nerve root or the spinal cord in the lower back; the very material that can cause intense pain and limit mobility for the patient. This surgery is generally considered when a patient is experiencing pain, numbness, or weakness in the afflicted areas, to the extent that it limits a person’s mobility and functionality. In general, this operation is performed only if other noninvasive procedures are attempted and failed. 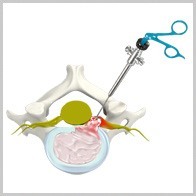 The procedure starts with the use of a microscope to have a look at the nerves and the disc. Guided by this image, the surgeon makes an incision in a precise manner; thus ensuring limiting damage to the tissue surrounding. The dissection removes a ligament that extends from front to back in the body, accessing the spinal canal and stripping away any disc material or bone spurs sticking out through the ligament. And, since the gist of the disc is removed through this surgical procedure, the odds of recurring back pain are greatly reduced. In the wake of this surgery, patients are encouraged to walk and exercise as often or as much as possible; and to return to work within two to eight weeks, depending on the nature of the labor. Discectomy spine surgery usually has a very high success rate. An NCBI study showed that 84% of people who have discectomy surgery experienced no issues in their mobility post recovery! The article also states that patients who have the surgery tend to benefit better in the first two years than those who chose nonsurgical treatment, but every case is different. Undergoing any type of back or spine surgery assumes some degree of risk, so discectomy surgery must assume the following. A Dura Tear (a watertight sac of Cerebrospinal fluid between the spinal cord and the Dura mater) occurs anywhere between 1% and 7% of discectomy surgeries. The leak does not change the results of the herniated disc removal surgery, but the patient may need to be bedridden days after surgery to allow the leak to heal. If the leak is severe, a second surgery might be necessary to seal the Dura tear. Overall, this procedure has been known to supply the patient with faster pain relief than nonsurgical alternatives. Right after your discectomy, the doctor and his staff will encourage you to protect your back while continuing to be as mobile as possible. Several short walks should be taken each day, and care should be taken to avoid prolonged, slouched sitting and heavy or repetitive lifting. Pain around surgical incision may occur as it is healing. This is normal and nothing to worry about. You will need someone to check your surgical incision to see if redness or discharge forms, as this could be a sign of infection. If you are feeling any severe discomfort or issues or with your incision or back, call the doctor immediately. The first week after your discectomy surgery, your doctor should have a scheduled meeting. He or she will ask you about your recovery and activity level. At this time, you should be taking at least 3-6 daily walks to aid the recovery process, which will help you achieve an increase in mobility. During your visit, your doctor will check your surgical incision and remove stitches that may still be present. He or she will also encourage you to increase your activity level while avoiding heavy or repetitive lifting. Pain should be minimal at this time and you should start to feel inspired by your progress. Increasing your activity and mobility is just as important as the surgery itself for a successful recovery! One month after surgery, you should start to feel back to normal. Your sciatic pain should have subsided and you should be walking daily for exercise (at least a half a mile). A follow-up appointment is recommended at this time for your doctor to see your activity progress and see if you are ready to return to work. If your job does not require you to be mobile, you may be able to go back to work after a few days. If your job requires you to perform manual labor, your doctor may require that you do not return to work for a few more weeks. The majority of patients benefit from a short course of physical therapy after their discectomy, and we highly recommend you participate in this. Your PT can teach you exercises to help you gain strength, range of motion, restore normal mobility, and prevent future problems from occuring. Discectomy recovery time is anywhere from 4 to 6 weeks, but you may be feeling back to normal well before that time. Because each case is different, it is important that you follow your doctor’s precise instructions rather than follow a generic guide to recovery. To learn more about the discectomy surgical procedure, and how it can help you resolve your herniated disc condition, please contact Dr. Payam Moazzaz at New Era Spine for an immediate consultation.